Cape Town stadium spent an evening with Californian folk rock band the Eagles as part of the band’s 40th anniversary tour. Hordes of fans that grew up with the band’s music, and now find themselves to be accountants and lawyers, pilgrimaged their way to Cape Town Stadium alongside a fair contingent of the more youthful. Cape Town stadium spent an evening with Californian folk rock band the Eagles as part of the band’s 40th anniversary tour. Hordes of fans that grew up with the band’s music, and now find themselves to be accountants and lawyers, pilgrimaged their way to Cape Town Stadium alongside a fair contingent of the more youthful. The lights went out around 8pm to massive cheers as The Eagles made their entrance, leading off the show a capella. Glenn Frey addressed the crowd with a standard “Ladies and gentleman, how long have we waited for this night to play in South Africa.” A middle-aged woman behind me cried: “This is awesome”. Bassist Timothy B. Schmit, took the reigns on vocals and offered a deep bow, and the same woman behind me responded again with: “Aww, he’s so cute”. Coruscating visuals and slick close up footage of the band gave the evening intimacy, outdoing my own experience of watching a live performance DVD, especially with their superb performance of “Boys of Summer”. On the downside, signature track “Hotel California”, was given only a short and mediocre rendition. 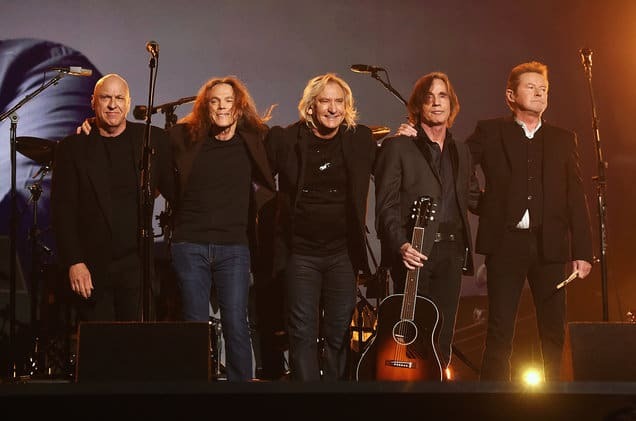 The Eagles may be in their sixties, but they performed with vigour and ease. After playing “Witchy Woman”, Frey mused on their early days: “We composed this song in just two days, back then, we lived fast.” Weirdly, the crowd applauded agreement, probably feeling their nostalgic craving satiated. After all, it’s the first and probably last time The Eagles will play in South Africa. To be there and see it was more important than whether or not you’re a die-hard fan.